CAIRO (CNS) — Here is the text of the common declaration on baptism between Pope Francis and Coptic Orthodox Pope Tawadros II, signed April 28. 1. We, Francis, bishop of Rome and pope of the Catholic Church, and Tawadros II, pope of Alexandria and patriarch of the See of St. Mark, give thanks to God in the Holy Spirit for granting us the joyful opportunity to meet once more, to exchange a fraternal embrace and to join again in common prayer. We glorify the Almighty for the bonds of fraternity and friendship existing between the See of St. Peter and the See of St. Mark. The privilege of being together here in Egypt is a sign that the solidity of our relationship is increasing year by year, and that we are growing in closeness, faith and love of Christ our Lord. We give thanks to God for this beloved Egypt, the “homeland that lives inside us,” as His Holiness Pope Shenouda III used to say, the “people blessed by God” (cf. Is 19:25) with its ancient Pharaonic civilization, the Greek and Roman heritage, the Coptic tradition and the Islamic presence. Egypt is the place where the Holy Family found refuge, a land of martyrs and saints. 2. Our deep bond of friendship and fraternity has its origin in the full communion that existed between our churches in the first centuries and was expressed in many different ways through the early ecumenical councils, dating back to the Council of Nicaea in 325 and the contribution of the courageous church father St. Athanasius, who earned the title “Protector of the Faith.” Our communion was expressed through prayer and similar liturgical practices, the veneration of the same martyrs and saints, and in the development and spread of monasticism, following the example of the great St. Anthony, known as the father of all monks. 4. With deep gratitude we recall our own fraternal meeting in Rome on May 10, 2013, and the establishment of May 10 as the day when each year we deepen the friendship and brotherhood between our churches. This renewed spirit of closeness has enabled us to discern once more that the bond uniting us was received from our one Lord on the day of our baptism. For it is through baptism that we become members of the one body of Christ that is the church (cf. 1 Cor 12:13). This common heritage is the basis of our pilgrimage together toward full communion, as we grow in love and reconciliation. 5. We are aware that we still have far to go on this pilgrimage, yet we recall how much has already been accomplished. In particular, we call to mind the meeting between Pope Shenouda III and St. John Paul II, who came as a pilgrim to Egypt during the Great Jubilee of the year 2000. We are determined to follow in their footsteps, moved by the love of Christ the good shepherd, in the profound conviction that by walking together, we grow in unity. May we draw our strength from God, the perfect source of communion and love. 7. As we journey toward the blessed day when we will at last gather at the same eucharistic table, we can cooperate in many areas and demonstrate in a tangible way the great richness which already unites us. We can bear witness together to fundamental values such as the sanctity and dignity of human life, the sacredness of marriage and the family, and respect for all of creation, entrusted to us by God. In the face of many contemporary challenges such as secularization and the globalization of indifference, we are called to offer a shared response based on the values of the Gospel and the treasures of our respective traditions. In this regard, we are encouraged to engage in a deeper study of the Oriental and Latin fathers, and to promote a fruitful exchange in pastoral life, especially in catechesis, and in mutual spiritual enrichment between monastic and religious communities. 9. Let us intensify our unceasing prayer for all Christians in Egypt and throughout the whole world, and especially in the Middle East. The tragic experiences and the blood shed by our faithful who were persecuted and killed for the sole reason of being Christian, remind us all the more that the ecumenism of martyrdom unites us and encourages us along the way to peace and reconciliation. For, as St. Paul writes: “If one member suffers, all suffer together” (1Cor 12:26). 10. The mystery of Jesus who died and rose out of love lies at the heart of our journey toward full unity. Once again, the martyrs are our guides. In the early church the blood of the martyrs was the seed of new Christians. So, too, in our own day, may the blood of so many martyrs be the seed of unity among all Christ’s disciples, a sign and instrument of communion and peace for the world. 11. 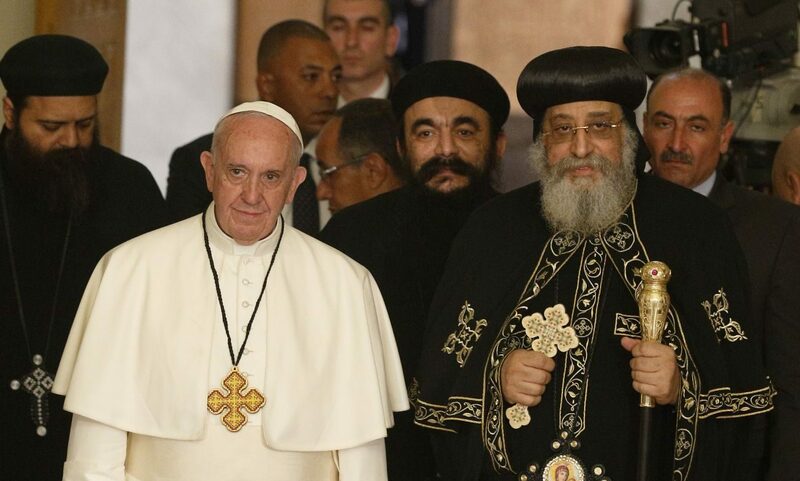 In obedience to the work of the Holy Spirit, who sanctifies the church, keeps her throughout the ages, and leads her to full unity — that unity for which Jesus Christ prayed: Today we, Pope Francis and Pope Tawadros II, in order to please the heart of the Lord Jesus, as well as that of our sons and daughters in the faith, mutually declare that we, with one mind and heart, will seek sincerely not to repeat the baptism that has been administered in either of our churches for any person who wishes to join the other. This we confess in obedience to the holy Scriptures and the faith of the three ecumenical councils assembled in Nicaea, Constantinople and Ephesus. We ask God our Father to guide us, in the times and by the means that the Holy Spirit will choose, to full unity in the mystical Body of Christ. 12. Let us, then, be guided by the teachings and the example of the apostle Paul, who writes: “(Make) every effort to keep the unity of the Spirit in the bond of peace. There is one body and one Spirit, just as you, too, were called to the one hope of your calling, one Lord, one faith, one baptism, one God and Father of all, who is over all and through all and in all” (Eph 4:3-6). Armenia) have basic differences in their doctrine(dogmatic issues). So, I am not clear with, what it mean by one baptism is enough?